Let us discuss various Exit statements which are quite useful in automation testing Using UFT.These statements are part of Vbscripting(Latest version) and when implanted in the code provides better control on the flow of execution of automated Tests. It is also used in Error handling as and when some exception occurs we can use ‘Exit’ statements. 1.Exit Do, it is used to Exit a Do….Loop Statement. 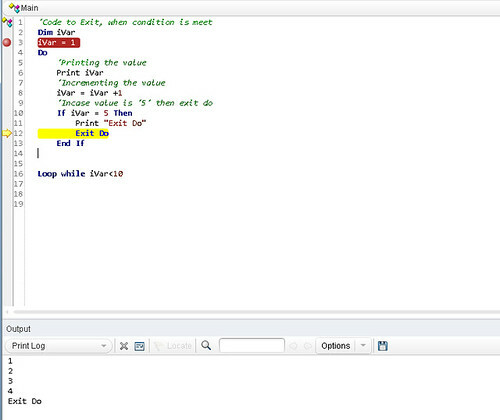 It transfers the control to the statement following the loop statement. 3.Exit Function, as the name indicated it is used to Exit the function and execution is transferred to the statement that called the function. 4.Exit Property, Immediately exits the Property procedure in which it appears. Execution continues with the statement following the statement that called the Property procedure. 5.Exit Sub, similar to Exit Function, difference lies in the fact that it is used to Exit an Sub rather than a function. Exit Do:-When used within nested Do…Loop statements, Exit Do transfers control to the loop that is one nested level above the loop where it occurs. Exit For:- When used within nested For loops, Exit For transfers control to the loop that is one nested level above the loop where it occurs. Test Directory structure of UFT files.